As a former house-pig, Dustin’s first few months at the sanctuary were very tough. His whole world had been turned upside down and he had great difficulty adjusting to his new way of life. Depressed and scared, Dustin hardly ate and hid on his own for days. 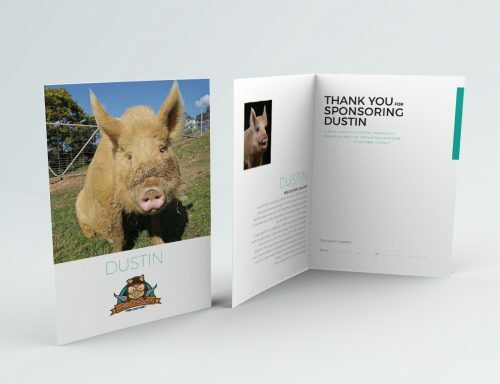 To help build his confidence, gentle Dustin was slowly integrated with rescue pigs, Harriet and Wilbur, over several months. Now, Dustin is very much part of the WPF pig pack – together they spend their days digging and foraging for food, roaming free in paddocks and wallowing in mud to cool off. Dustin clearly enjoys his sanctuary life. Safe and happy, he need never worry again. As a sponsor, you will receive a beautiful colour photo-card of Dustin along with his personal profile. This will be mailed within five working days of receipt of order.